Your browser doesn’t support HTML video. Are you sure your browser is up-to-date? This is a normal speed recording of the program running. All mouse actions were performed by the program except for the initial double-click on the League of Legends icon. You may need to “unblock” the downloaded file on recent versions of Windows, as seen here. If your password isn’t entered at first, just re-run LoL Auto Login without closing the client and it should work. If something doesn’t work, follow the instructions under Troubleshooting and I’ll get back to you as soon as possible! If LoL Auto Login doesn’t work for you, please create an issue on GitHub with your complete latest log included (it should be in C:\Riot Games\Logs\LoL Auto Login Logs or something similar). Make sure to look through existing issues and check if anyone else has already posted your issue before creating a new one! Your password is encrypted and stored in a file called password next to the LoLAutoLogin.exe file. You can check the source code on GitHub if you want to see how everything works. Run the installer. If you installed League of Legends somewhere else than C:\Riot Games\League of Legends, make sure to select the base folder of your League of Legends installation as the installation folder for LoL Auto Login. 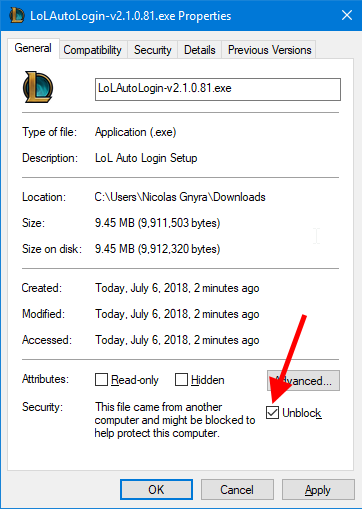 Extract LoLAutoLogin.exe into your League of Legends directory (usually C:\Riot Games\League of Legends). Create a new shortcut leading to LoLAutoLogin.exe on your Desktop and remove the default Play League of Legends one, or just edit your current one to point to LoLAutoLogin.exe. In the newly opened window, enter your password and click Save & Start League of Legends. League of Legends is now configured to launch automatically, enjoy! If you ever need to start the client normally, whether to repair your install or to change some settings, you simply need to hold down the Shift key as you run LoL Auto Login. You must press the key before starting the program, and keep it held down until the launcher becomes visible.